We’re house hunting and I need help. But first, I’ll tell you about this brussels sprout salad. House lovers, scroll down. This salad = yumyumyum. 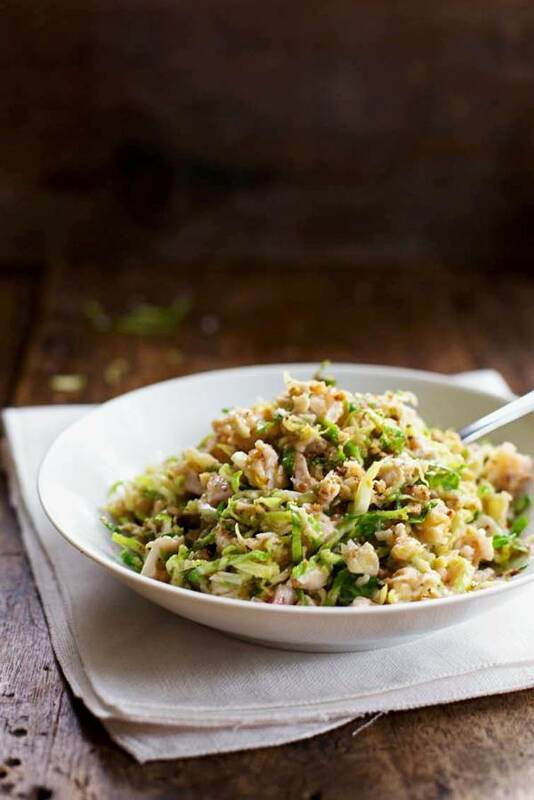 I have always loved thinly sliced Brussels sprouts in salads (I slice mine on a mandoline – works like a veggie cutting charm) and I am a sucker for chopped salads with lots of texture, like that Chopped Thai Chicken Salad. We have juicy chicken, toasted walnuts, and shredded Parmesan going on in this bowl with the crunchy greens, plus the most creamy dreamy wonderful dressing ev-er made from fresh orange juice, honey, and sauteed onions. Oy. I superlike it. Guess what Bjork said when I sent this to work with him? And yes, maybe I do pack his lunches because maybe I have a compulsion to eat every single leftover morsel ever, and he has no idea what’s in the fridge, so what? He said this: THAT SALAD IS REALLY GOOD. And just like that I’m married to a person who likes Brussels sprouts. Okay, house time. We went into this process thinking that we were looking for an older, charming house in the city that had character AND lots of newer updates, including a large window-y dream kitchen, was close to parks and shops, and was within price range. And then we somehow ended up with these two as our current leads. This little guy is a very practical house very close to where we currently live, featuring a super open floor plan and totally spotless rooms. It’s in a great school district, close to good friends, and within walking distance from a great park. Not makes-my-heart-pound-adorable, not in our dream city neighborhood, but nice, clean, and comfortable. I really feel like we could move into that house tomorrow and we’d be settled in by dinnertime. Then it would be Christmas morning and I could stand in the kitchen and look over a breakfast buffet type thing into the living room (open floor plan, yeah?!) and gaze upon my husband and my future pug snuggling by the fireplace, and simultaneously flip pancakes onto my future and hypothetical children’s plates as they sit across the way at the dining room table in all their pajama cuteness. I’m not crazy about the exterior of the house and it doesn’t have a huge zing factor, but… do we even need zing? I don’t know. I can easily imagine us being very happy and comfortable there. PS. Visualization is how I house shop. I think it’s a girl thing. As soon as I saw it from the street, I fell in love. Then I saw the inside – the fireplace in the living room, the hardwood floors, the large master bedroom with lots of big windows, and the original 1940’s kitchen wood cabinetry with lots of detail, and fell in love deeper-ly. But guess what? It’s dirty and old and needs major updating. We would be buying the house with the intention of putting some serious money into renovating it with refinished floors, new paint, and a partial kitchen re-do. But can I just run with this for another minute? It has absolutely undeniable old charm in things like arched door frames, a curlycue banister, a future playroom cedar attic, and a swinging door from the dining room into the kitchen. EEEP! What?! We had said we weren’t going to do a fixer-upper this time around, but we got completely sucked in by the sweet story-like details of this place. I LOVE the potential that I see when I look at this home. It’s on a golf course, it’s within walking distance to a popular park on a lake, and it’s in a great city neighborhood with lots of other cute old houses on the block. But wait. Golf course? Is that weird? We can’t decide. It’s like literally we can see the golfers teeing off right in the backyard. But then, the view is great, and we sat on the back porch for a while tonight to test it out and we kinda liked just watching people zip around in their golf carts across the open green. It wasn’t too noisy or anything, other than the occasional ping of the golf ball. Then the police came and kicked us out for being creepers and sitting on a porch that we don’t own. Just kidding, but they probably should have. Will you tell me what you think? We need some help. Especially if you’ve done the fixer-upper thing and especially if you have anything to say about the golf course. It was actually really helpful to hear from you when I posted that picture of the house with the small kitchen on Facebook way back when – you talked some sense into me, like don’t buy a kitchen that can only fit one person. Good advice. I need some peeps who can help me set my house-buying emotions straight. Yer cool, guys. 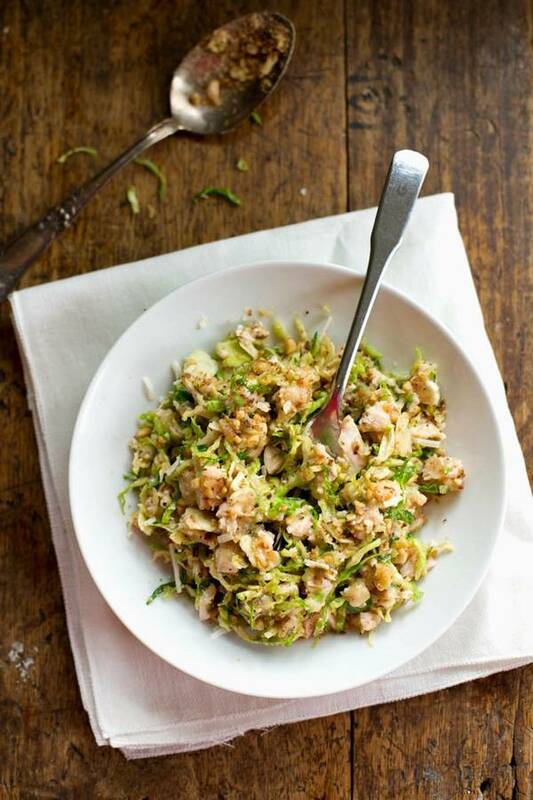 This Chopped Brussels Sprout Salad has chicken, toasted walnuts, and Parmesan with a homemade honey orange dressing. Super yummy! Prep the salad: Prepare the chicken. Prepare the Brussels sprouts by very thinly slicing them with a mandoline. In a food processor, pulse the walnuts a few times until chopped. Place in a small skillet over medium high heat with no oil or butter and toast until golden brown, stirring or shaking constantly. Make the dressing: In the small skillet, saute the butter and onion over medium high heat until the onions are golden brown, about 5 minutes. Transfer the onions to a food processor. Add the orange juice, honey, and olive oil. Puree until smooth and creamy. Season generously with salt and pepper. Place the Brussels sprouts in the empty sauteed onion pan and place over high heat. Stir for 1-2 minutes until you can smell them and they turn bright green. Remove from heat. In a large bowl, toss the the Brussels sprouts, walnuts, chicken, and Parmesan. Toss the dressing and salad together. Serve warm or cold. If you plan to keep leftovers, keep the dressing separate. You can also eat this salad with the raw shredded Brussels sprouts – just skip the step of sauteing them. I found that sauteing them slightly just brought out color and flavor and helped the texture soften just slightly. I vote for the charmer! It might need a little TLC to fix it up but it sounds like it would fix you and Bjork perfectly 🙂 And as a brussels sprout lover, I am obsessed with this salad. 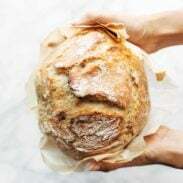 Trying this recipe as soon as I get my hands on some! Oh man both house sound awesome, but golf course are never any fun to live on…….. Okay, that may just me my crazy family though! I say go with your gut and what your truly love!! I personally love this salad!! Brussel sprouts are so my thing and this is calling my name! OH and I need to start chopping brussels sprouts and putting them into salads because this looks awesome! I compromised and met in the middle. We got an older charmer that was fairly update with a couple of area’s that we could look forward to updating in the future. Best of both worlds. I vote for easy to move into! My husband and I are both teachers and bought our first home six years ago. We had the same dilemma as you. I never regretted buying easier and newer, as my brother did the opposite. The problems in his house always end up ten times more expensive and extensive than he thinks (including limitless bats!). Our new house, even though it was new, still required a lot of work to make it the way we wanted it- and things always need work (like the current family of a million bees trying to take over the attic). And while my brother had romanticized how fun it would be to fix-up and remodel with his wife, it doesn’t exactly always pan out that way. 🙂 That being said, this is your dream! Good luck and happy house hunting! And have a great start to the school year! That salad is gorgeous! And I know you guys will make the right decision about the house – both sound like great options! I love, love, love Brussels sprouts salad. The shredding really transforms it. I love the addition of chicken and your dressing looks divine. THANK YOU! House hunting?! So exciting, Linds! I vote for the fixer-upper. Nothing beats charm. But they both sound wonderful and you will make any house a home. There ARE some really cute houses in Wauwatosa, WI…just saying. Also – this salad looks delish. Miss you two. Can’t wait to hear what you choose!! If you have the time & money, I’d go for the fixer upper. You guys clearly love it. If you buy the first one, will you spend the whole time dreaming of the fixer upper and regretting not buying it? That would probably make my mind up for me. Hi, First time posting. I found your blog last week and love it. Thanks for all these delicous recipes. Oh, and also the recommendation for the Cooking Light Superfast cookbook – oh my god that was a god send. Ok, I don’t know what your situation is. But if you plan to have kids within the next two years, think about how long a renovation will really take you. Because once you have kids – EVERYTHING gets put on hold for a while and then things just take a lot longer to get done when you do manage to resurface. Also, keep in mind that renovations ALWAYS take more money, and more time than you originally planned. Especially older homes. Stop watching HGTV. Seriously. They make it look too easy. Another point – can the fixer upper be an open-floor plan? We bought a little fixer upper with a closed off kitchen and a living room that is accessible through the dining room (ie, on the opposite side of the kitchen). I have two small kids and I wish every day that I had an open kitchen. If I knew then what I know now, I would have made an open-floor plan a must have. I don’t have a lot of time to cook, and when I can cook it is really hard because I have to run back and forth between the kitchen and the living room to make sure the kids aren’t into something they shouldn’t be into. I dream of just being able to turn my head to look at them while I’m preparing their dinners. Alas, not this house. But the next one for sure! Good luck. I know it’s a tough decision! Wow – this was really good for me to hear. Thank you! This is a easy one. Don’t settle!!! I think if you buy the fisrt house you will always wonder “what if” or “should we have”. Now to the fixer uppper….I’m sure you already know, but have the house inspected to make sure that there isn’t bigger issues like water or foundation damage, is the electrical, furnace up to date, windows sealed etcetera. Fixer upper! We’ve done two fixer. One we did 100% DIY and cheap. One we did right (although we were still very budget conscious). If you’re going to do it, do it right. That doesn’t mean you can’t do things yourself. Just really think about what you’re going to do and do it right, hiring out here and there. With the second house, we knew that we could either afford a house that would be a fixer upper in 5-10 years or we could go for a much cheaper house that needed a lot of work right away, but we could then afford to make it just the way we wanted. We chose #2. Let’s just say that the move from the US to Korea was tough. I miss my 73 square feet of counter space!! This recipe will be going on my list for the week … except with baked tofu. Thank you! 1. This dish looks amazing, and the onion vinaigrette is a must-make, delish! 2. I think you should go for the fixer upper. Charm and old school craftsmanship are hard to come by, and it seems you and Bjork make a great team, so I think you’d enjoy the challenge of fixing it up! Maybe ask yourself if you guys would enjoy spending time working on a house together (and have time for). If the answer is yes, it could be totally worth it! I say go with the fixer upper and get it all fixed up before those hypothetical children show up! We moved into an older home about a year ago and are still struggling to get any fixing done with three littles under foot. If you really don’t want to do anything then get the easy mover, but I think the charming old house would be good for your creative blog work. I’ve never lived on a golf course, but aren’t all the nicest houses on golf courses? I lived downstream from one at our last house (wow, that screams Wisconsin) and we got a lot of free balls, so… can’t wait to see what you decide! Wow that is a beautiful salad with lots of fantastic flavors. Can’t wait to try! I have been adding roasted walnuts lately to everything. Thanks for giving me the inspiration. As for the home, we have a saying in Vietnamese: you don’t find the house, the house finds you. You will know it in your heart when you see it. Good luck! OK so one, this brussels sprouts salad is like my spirit animal. I lovelovelove brussels sprouts and crunchy salads, so the combo is kind of blowing my mind right now. So there’s that. Can’t wait to find out what you decide, friend! We live on a golf course and love it! In 14 years, windows have been broken only 3 times, and it’s exceptionally entertaining to watch the terrible golfers searching for their “fore!”s. You didn’t mention price…but I think it depends on where you’re at right now. Do you want to sink money into a place? Or are there other things you need to save or spend on right now? The first house appeals to me more. Good point! They are actually both the same price and at the bottom of our price range, so we’d have room to put some money into the second one. I lived right on a golf course when I was little. I used to go out and collect lost golf balls and tees, then try to sell them back to golfers for 25 cents. So, that could be fun for those future children of yours! First, the salad looks fantastic. I now know what I’ll be having for lunch next week. About the houses, it sounds like you really want the second one. I just recommend making sure you can do all the renovations that you really, really want to do as soon as possible. Before you move, if possible. Or before you unpack everything. At least before you get that pug puppy because that will end up taking up all of your time! Once you get settled and on to other things, it is really difficult to start up the home improvement momentum again. This salad sure looks delicious..
Fixer upper sounds very interesting. The golf place sounds awesome, would be nice. All the best for your exciting new venture. I hate to say it, but I think maybe you should look at more homes? What do you think? When it’s the one (of your dreams) you’ll know right off the bat, without hesitation, at least that’s what most real estate agents say. when buying our current house, we looked at THREE houses on golf courses, because we liked it so much – you are pretty much guaranteed to never have development / neighbors behind you!